An elegant sterling silver twist ring set with a stunning square shaped diamond cluster. Finished with a single diamond on either side of the cluster and delicate milgrain detailing on the twists of the shoulders, this beautiful ring is perfect for a touch of sparkle and glamour. Sterling silver 12 point diamond square cut cluster ring is rated 5.0 out of 5 by 6. 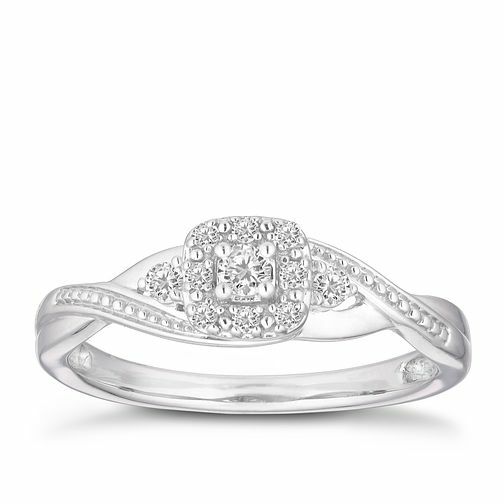 Rated 5 out of 5 by Anonymous from Engagement Success Beautiful ring, nicer in person i'd add. Fiancé loves it's vintage style and the diamonds really lit up in the sun. Couldn't be happier with this.